To celebrate 60 years of sailing Scottish waters, the author single-handedly sailed Halcyon, a 32ft wooden yawl, from Fairlie on the Clyde, round the Mull of Kintyre by way of numerous inner islands to Barra in the Outer Hebrides and to the Atlantic side of the islands, not often visited by cruising yachts. Bad weather forced a diversion to explore the sea lochs of the west coast of Harris and Lewis, the islands of Taransay (of the BBC's Castaway series) and Scarp, famed for its ingenious 'Rocket Post' experiment. While visiting these numerous islands, he met local people and experienced the sometimes violent extremes of weather such as when he was storm-bound in Stornoway for several days. There are stories galore about the island people, snippets of interesting history, legends and folklore, tales of the sea and island life, the Hebridean fishermen and lighthouses - thus uncovering another dimension of island life. Bob recounts his travels and tales, some previously unpublished, in a relaxed and highly-readable style. 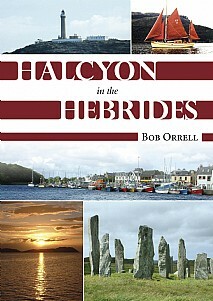 As well as being a unique travel book, it is an insight into the rapidly-changing ways of island life and a useful sailing guide to the Western Isles and anchorages in the Hebrides. It would be of immeasurable help to sailors keen to venture into some of the lesser-known sailing areas of Western Scotland. This vivid and entertaining story of adventurous sailing among Scotland's beautiful but challenging Western Isles will be enjoyed by keen sailors and armchair travellers alike - a truly memorable journey of over 1000 miles! An enjoyable story that will be of especial interest to all sailors, outdoor enthusiasts, adventurers and anyone who appreciates a good read.